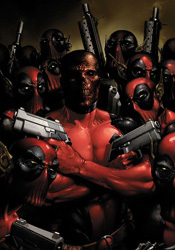 It hasn't even been one month since the launch of Deadpool's own self-titled monthly series, and already the Crimson Merc has stirred things up significantly. Attending a summer baseball game at the very moment the Skrulls unleashed their terran invasion, (undercover as a team mascot, naturally) Wade Wilson single-handedly took down an entire unit of green skins. But when it came time to deliver the deathblow, he hesitated… and then defected. Now he's aboard the mothership, yakking it up with the folks in charge, while the Earth burns beneath them. An introduction to a very wary Skrull empire provides Deadpool with all the excuse he needs to share the story of his origin, which is thankfully kept quite simple. When you can whittle the very core of a character down to four easy-to-digest pages, that either means his story has been streamlined to perfection or he's a very shallow individual. Writer Daniel Way leaves little doubt in his reader's minds - it's the former. While retelling Deadpool's origins so early in the series may seem a bit excessive, Way ties it into his relationship with the Skrulls admirably. Although his new bosses are suspicious of his intentions at first, by the time he's finished relaying his tales of woe and explaining how his unique set of abilities can aid the empire, Wilson has the entire Skrull empire drinking his Kool-Aid. Wade is such a personable, fast-talking, wheelin', dealin' SOB that it's easy to root for him, even when he's working against humanity's best interests. I think what's most impressive about this issue is the delicate balance it maintains between comedy and action, two genres that don't always mix well. Many of Wilson's puns are either ignored or written off as cultural misunderstanding by the Skrulls tasked with analyzing his threat level, which means the aliens play a great straight man. They also keep the narrative moving forward when Deadpool would have otherwise spent most of the issue goofing around and amusing himself. It's a shame this invasion has to end at some point, because ‘Pool and the Skrulls make for a better combination than Wilson ever enjoyed in Cable and Deadpool. Never underestimate the value of a creature that can't tell when it's being made fun of. Paco Medina is given plenty of toys to play around with in his artwork this month, and he capitalizes on almost every occasion. His work, a nice blend of Ed McGuinness's substance, Mark Bagley's action and Travis Charest's gorgeous posturing, brings a lot of personality to the page and never relents. Medina always brings a light visual humor of his own to the proceedings, whether it's in the body language of a frustrated Skrull with a speaking part or something subtle that's going on in the background. Many of Daniel Way's jokes would have fallen flat in the hands of a less-skilled artist, but Medina not only enables them to connect, he enhances them in his own way. He delivers great action scenes, spices up the conversational scenes and keeps the whole package easy to read and exciting to navigate. Thumbs up. It's rare that a character who's supposed to be funny actually accomplishes that feat, but the current iteration of Deadpool hits the mark with surprising accuracy. This month's issue is an absolute joyride, fun and games from the very get-go, and while that kind of story never really seems to accomplish much of anything, this is an exception. It's a rare mix of raw entertainment, genuine substance and timely relevance, not to mention something you really ought to see for yourself. Buy it. It's a blast.